Original Wackies contained "sweet banana flavor bits" and it was referred to in television commercials as "Banana Wackies". We aren't sure weather a cereal box with the full title of "Banana Wackies" ever actually appeared, despite the name's inclusion on several cereal lists. If you have information, please leave a comment below. What do you think of Banana Wackies? This was a cereal my mother loved. It was the only kid cereal we would have to fight her over. It was like Lucky Charms, except the little marshmallow pieces were banana flavored, and the pieces were oat. Please bring Banana Wackies back. 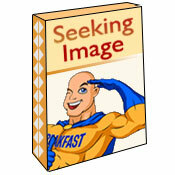 They were the reason I ate breakfast! 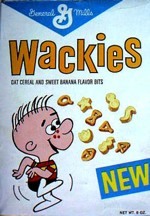 Banana Wackies was a very good cereal. So was Coco Puffs. Please bring Banana Wackies back! Oh how wish they would bring back my Wackies. My mother used to buy Banana Wackies for me. Then years later, I told her, "hey mom, remember when you used to buy me Banana Wackies for me?" and she looked me in the eye and said, "I never bought those for you I've never heard of Banana Wackies." I freaked out for awhile thinking maybe I was going crazy. But how can anybody make up a name like Banana Wackies unless they were real! Thank goodness for the internet. Please bring them back. They were great. Yeah I want Banana Wackies to come back on the market. I wish you would put the cereal back on the shelves. I'm 49 and I remember these as a kid. They were delicious with an almost overpowing banana flavor. Basically they were banana Lucky Charms. If I had the power to bring back cereals I would chose Banana Wackies and Crazy Cow. On a scale of 1 to 5, these go to Eleven!!! Ren: Now this, They gotta breeng back man! Red Guy: Oh ho ho ho ho! Pure Nostalgia! 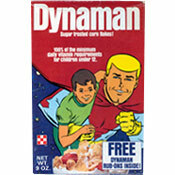 Okay this was and if were still around would be my all time favorite breakfast cereal, I so miss them. I wish they still had that around so I can eat them.